I was delighted when the Brew Company got in touch asking if I wanted to review one of their Coffee Brewer Advent Calendars (RRP £34.95). These are the ideal way to countdown to Christmas. Basically most parents survive on coffee and December can be a particularly hectic month! We have presents to wrap, extra social events on the calendar and lots more to do at our children’s schools. Being able to enjoy ground premium coffee is a wonderful way to start each day. Furthermore it’s so easy to prepare, because it brews in its own special bag in 4 to 6 minutes. Then you just appreciate the convenient but very tasty experience! It’s an innovative design that really works with our lifestyle. The Brew Company understand just how important that first cup of coffee (or tea!) is for setting you up for the day. Time is precious in the mornings, so this is one way to make sure you get quality coffee when you need it most. My husband and mum are the coffee drinkers of our family and they love the convenience of this product. Additionally it’s attractively packaged making it a real treat for coffee lovers. Inside the box are 25 Coffeebrewers which make enough for two cups of coffee each. It’s lovely to see adults having the same enthusiasm for the advent calendar as the kids! The Coffee Brewer Advent Calendar is a good way to be introduced to lots of different estate speciality coffees from Nicaragua, Kenya, Peru, Costa Rica, Indonesia and Bolivia. It’s a coffee education in a box! 13 of the 25 Coffeebrewers contain specialty coffee and the remaining 12 are organic and fair-trade coffees. 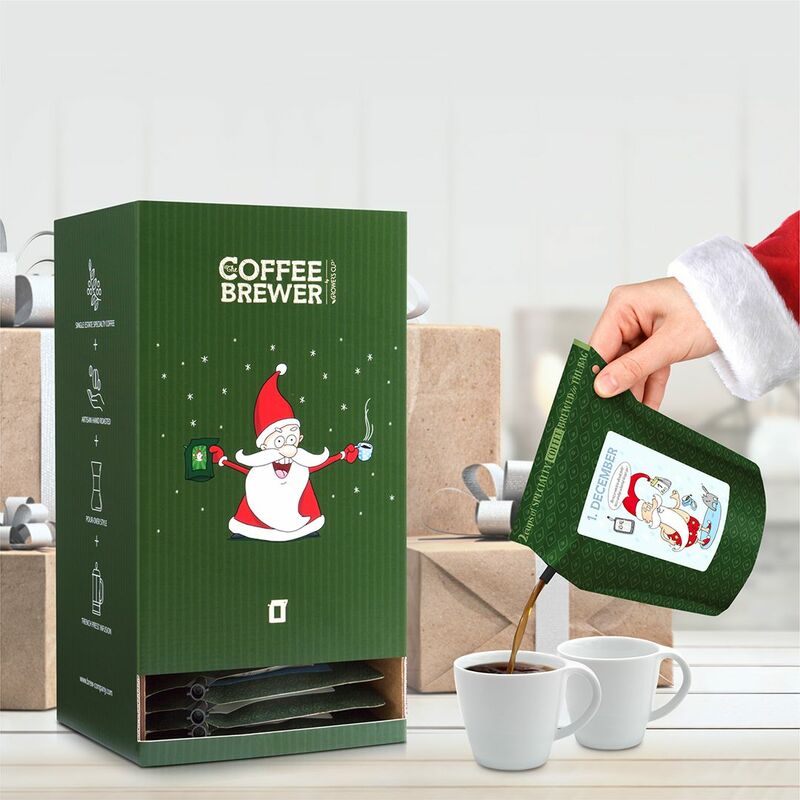 This advent calendar is also the gift that keeps giving as you can reuse the Coffeebrewers as long as you don’t get the outside kraft paper wet. Just top them up with more coffee grounds and continue to enjoy the handy experience. You can find out more information on stockists from The Brew Company website. I have two prizes to giveaway one Coffee Brewers Advent Calendar and one Tea Advent Calendar (can’t let the tea drinkers miss out!). The first winner will be given the choice of which of the two advent calendars they would like. The tea calendar will introduce you to 22 different flavours all made with premium herbs and fruit bites. If you would like to enter please fill the form below by the 18th of December. Yes, it’s a bit late as an advent but you can use it to get you through the January blues! Also check out my other competitions too! I love coffee and tea ! !